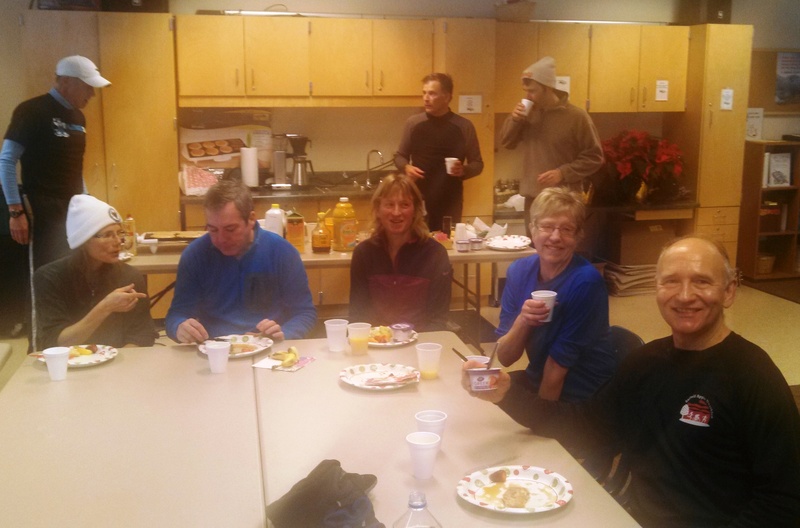 My running group had a New Year’s Day run, even though the temperature was -5 degrees at the start. Here is the devotional we shared together prior to our run. Mark 1:1 The beginning of the good news of Jesus Christ, the Son of God. Today is the beginning of a new year. Recently I was reading in Mark’s gospel and I was struck by this opening sentence. It is the Beginning of the good news of Jesus Christ. Now that may not be so profound, because it is the start of the gospel. But on the other hand, there is no final statement in the book that says, the End of the gospel. Only the beginning is mentioned. This reflects our relationship as a reader of the Gospel and as a disciple of Jesus Christ. We have a beginning in our relationship with Jesus, but we don’t have a finish line. We are continually growing, running, moving, becoming the person Jesus created us to be. God is not finished with me yet. And that is truly Good News. Afterwards, we enjoyed some pancakes and conversation. How are you starting your New Year? This entry was posted in Bible, Running, spiritual exercise, Uncategorized and tagged Gospel of Mark, Resurrection Lutheran Church on January 1, 2014 by Pastor John Keller. This morning I worship with our youth group at Highland Lutheran Church in Denver Colorado. We heard a perfect sermon for the beginning of our mission trip on the parable of the Good Samaritan. Pastor Dena Williams asked us who we are in the story. Are we the lawyer, the priest, the Levite, the Samaritan or possibly the innkeeper? Many of us like to think that we are a Samaritan willing to help others. She reminded us that Samaritans were marginalized, foreign, mostly hated people. Is that really how we see ourselves? Yes sometimes we are people who give help but we can just as easily be the broken person, beaten up and left for dead on the side of the road. We can be beaten up in so many ways: job loss, broken relationships, mental illness, chronic pain. We can give aid but we also at times need to receive aid. As the youth of Resurrection prepare to serve in Denver I pray that we may be as open to receiving aid and love as to giving comfort and care. We seek to trust Jesus, the storyteller, to give us our proper role. This entry was posted in Uncategorized and tagged Good Samaritan, love, mission, Resurrection Lutheran Church, service on July 14, 2013 by Pastor John Keller. Last Sunday I challenged the worshipping community at Resurrection to a prayer commitment. Following Jesus’ example of prayer in John 17 where he looked to heaven, I asked people to pray for three things and to commit at least five minutes daily to this task. Consistent prayer is vital to a congregation’s mission. Are you open to a prayer challenge? The first part of my challenge is to pray for those who are close to you: your spouse, children, siblings, parents, or significant others. Jesus prayed for his disciples. They had shared years of ministry together and had become a family. He asked his Father in heaven to protect his disciples. Our prayers for loved one can be that simple: for God to bless, protect and encourage them. Second, I encourage you to pray for your congregation’s mission. In our secular age, it is easy to forget that congregations have a God-given mission to accomplish. Jesus gave his mission to his disciples: to proclaim “eternal life, that they may know you, the one true God, and Jesus Christ whom you have sent” (John 17:3). At Resurrection we have that same mission, only we call it the Vibrant Life of Faith in Christ. A friend told me about his struggle to love his adversary. Every day as he went to work he saw a picture of the person and felt this internal anger rise up. It got to the point where he would take a different route to work so as to avoid the picture. He was discussing this with his wife when she suggested that instead of avoiding it, he simply pray for God’s blessing and joy to be with his adversary, to envision the person covered in God’s light. He listened to his wife and started praying. At first there was no change in his emotions, but he persevered. Gradually he felt his animosity dissipate. He grew to see his adversary as a fellow child of God. What are your prayer challenges? 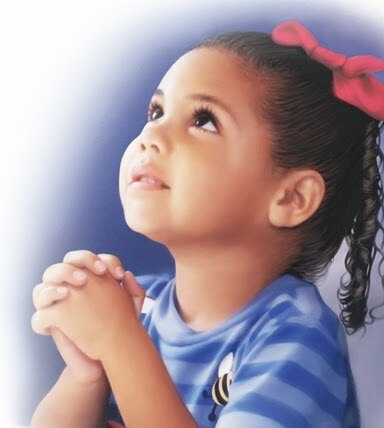 Lord Jesus, bless my family, church and enemies. This entry was posted in Bible, Jesus, love, Prayer, trust and tagged John 17, Resurrection Lutheran Church on June 8, 2011 by Pastor John Keller. Yesterday, five of us from Resurrection worked at a Habitat for Humanity house in St. Paul. In spite of the heat and humidity we hung sheet rock in the upstairs bedrooms. The challenge was learning how to put up ceiling sheet rock, especially above the stair case. Fortunately our crew had an excellent crew chief, Roger Henry, who showed us the right techniques and special tricks to get the job done. I have known Roger for over a decade. 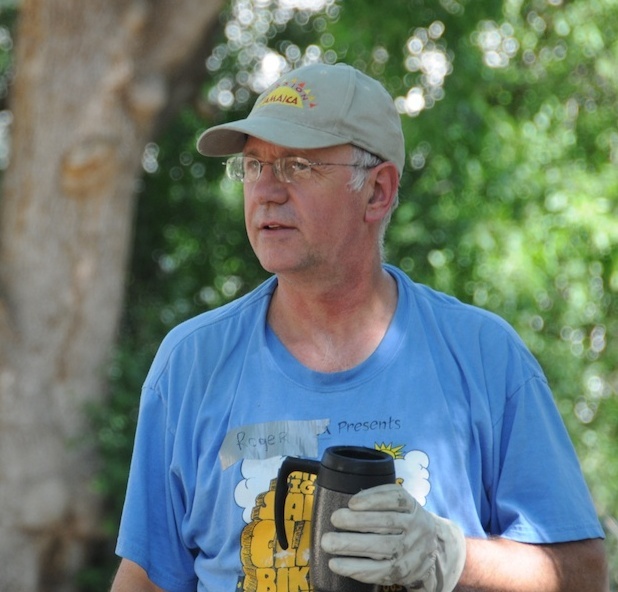 He has been a long-time volunteer and champion of Habitat for Humanity. He brings his own tools to the work site and gladly teaches novices like myself how to use them. He knows that most Habitat volunteers are not skilled construction workers and that he could probably do the job more easily by himself. Yet teaching others is one of his passions and joys. I like working with Roger (but please don’t tell him that!). I also have an abiding passion for Habitat for Humanity. I believe in its mission to build safe, affordable housing for people in need. They do NOT give away homes, but they invest in people. Any potential home owner needs to put over 500 hour of sweat equity into the organization, he or she needs to attend classes about home ownership responsibilities, and the family will have a mortgage when they move into the home. As Millard Fuller, the founder of Habitat, once said, “Habitat is not a handout, but a hand-up.” The modest house we worked on yesterday is only 1400 square feet and will probably house a family of five or more. Twin Cities Habitat has built more than 850 since its inception in 1985. Learn more at their website. 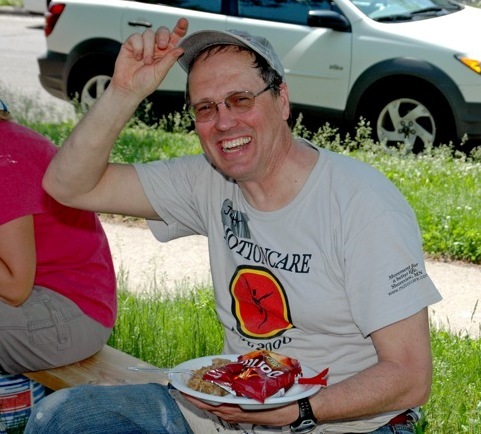 And whenever I have worked at a Habitat site, I have enjoyed a great lunch! As I reflect on the day, I am extremely thankful for organizations like Habitat for Humanity and for individuals like Roger Henry. They are expressions of hope and joy and make me smile. In a world that often seems dark and foreboding, they shine with the light of Christ. What people or organizations give you hope in today’s world? Lord Jesus, may we together shine with your light of hope. This entry was posted in Physical Exercise, service, Uncategorized and tagged Habitat for Humanity, Resurrection Lutheran Church, Roger Henry on June 7, 2011 by Pastor John Keller. One of my passions is consistent aerobic exercise. However my passion has been inconsistent, waxing and waning through the years. Through most of my adult life, I have had spurts of consistent running, only to be sidelined by the “urgency” of my daily life. This was especially true when my children were little. 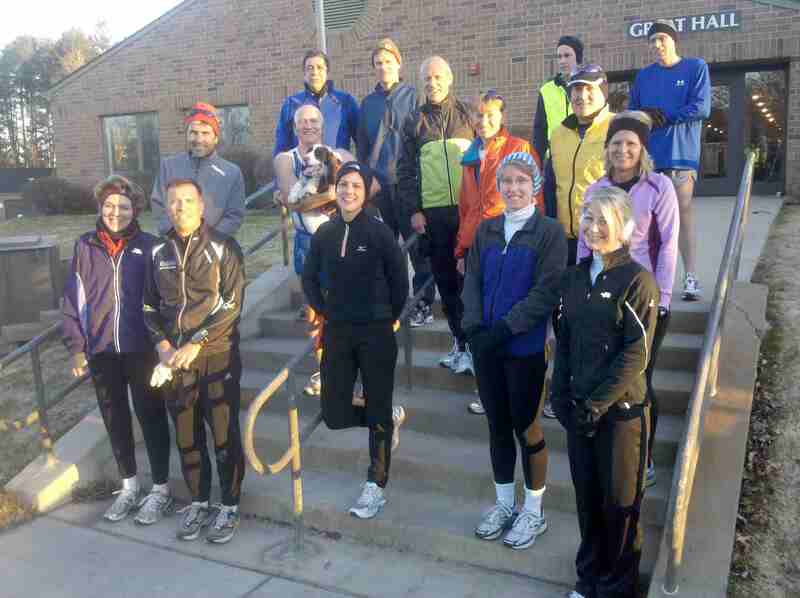 Then in the winter of 1999 Tim Torgerson approached me about starting a church-based marathon training group. He was looking towards October’s Twin City Marathon. I was gullible and naïve and so said yes. 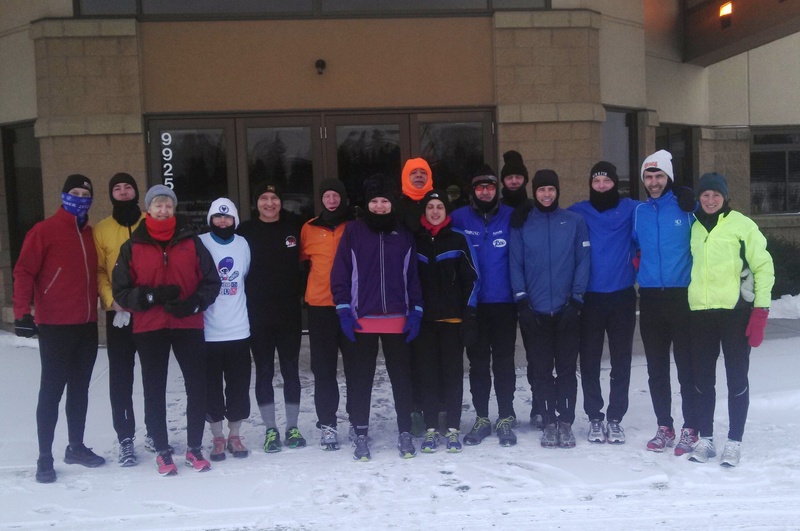 The training group started in March, running together on Saturday mornings. Each week we were accountable to each other. I had a training schedule to keep and people checking on me. However a dreaded “running injury” struck and I had to take a month out in June for physical therapy. Still I felt this need/desire to be back with the group as quickly as possible. Finally on October 3, 1999, I finished TCM with seven others from the group. After our suceess “the training group” became a year-round running club. Over the next ten years the St. Andrew’s Running Club gave me the support and encouragement to finish ten marathons. Last summer when I finished Grandma’s, I knew I needed a break to recover from some nagging injuries. Later I said good-bye to St. Andrew’s Running Club as I followed God’s call to Resurrection Lutheran. After a long winter of physical therapy, I am now finally ready to start running. Last week I was able to do three runs of 2-3 miles. I have also discovered a new joy with cycling. Last Wednesday Dave Johnson from Resurrection showed me some of the great bike routes nearby. Yesterday I biked with Tim and Dan and needed their support as I experienced my first three flats. Through these experiences, I have discovered that I benefit from a group to help me stay consistent in running or cycling. Which leads me to a question: Is anyone interested in a running or cycling club based here at Resurrection? Let me know. Lord Jesus, lead us into the fellowship groups you want us to have so that we might live the vibrant life. This entry was posted in Beginnings, Joy, Physical Exercise, Running and tagged bicycling, Resurrection Lutheran Church, running club, St. Andrew's Lutheran Church on May 31, 2011 by Pastor John Keller. After six months of thought, discussion, prayer, work and waiting, Resurrection Lutheran Church has a new look for its website. I am so thankful for all the creative work Sue Guck, Matthew Mayer, Susan Asplund, Sarah Storvick, and Betsy Hickey put into this project. They not only worked hard rewriting and reformatting information, but they had to tolerate my occasional rants and false starts. They are a great team and I am so thankful for each of them. The website has some new features: calendar, map and streaming audio. In the coming weeks we expect to add other features such an on-line registration, store and video. It remains a work in progress and your feedback is welcomed. Our primary goal is to introduce visitors to Resurrection and then to serve people within our community. The new look is part of the process of communicating our congregation’s mission and vision. Like many congregations, Resurrection is seeking how to best utilize the many tools the internet now provides: web, e-mail, Facebook, and Twitter. This blog is also part of the overall process. No one tool is sufficient by itself. Together they have the potential to reinforce our congregation’s mission: to call all people to a vibrant life of faith in Christ. The internet is a powerful set of tools for our mission. Yet there is an even better tool available. I am convinced that the best way to invite people to join our mission is face-to-face invitation. A warm personal invitation to a neighbor or co-worker has the power of the Holy Spirit with it. People are more likely to trust your personal words of invitation than all the e-mail, blogs or tweets that I or anyone can send. You are God’s missionary in your community. The last time I checked south Washington county is not beyond the ends of the earth. How do you bear witness to Jesus in a creative or caring way? Lord Jesus, show me a way to bear witness to you today. This entry was posted in Beginnings, service and tagged Resurrection Lutheran Church, website, witness on May 21, 2011 by Pastor John Keller. This morning I had a decision to make. One choice was to attend the Cemstone Run for Others, a 5K or 10K road race at St. Andrew’s Lutheran Church, my old congregation. I co-directed the race for over ten years and the lead pastor, John Hogenson, invited me to attend. My other choice was to help with the spring cleaning projects at Resurrection Lutheran, my new call. For various reasons, I decided to help with clean up at Resurrection. For one thing, the clean up would all be in doors, and this morning’s weather was raw with a cold wind and snow. I always enjoyed running in the Run for Others, but this year I am still in recovery mode and would not have been able to run. I certainly would have enjoyed seeing the many colleagues, congregants and community members at the race in spite of the weather. They are many deep relationships there for me. Still I enjoyed my morning at Resurrection. Allison and Owen are two young kids who came with their dad, Ian, to help out. They vacuumed up the small metal shavings on the tables that Ian and I repaired. 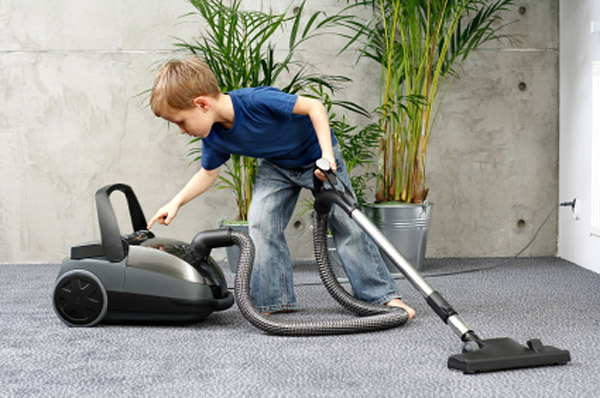 They also helped sharpen pencils and clean some of the carpet. At a recent new member class Allison and Owen helped me carry out some of the garbage and then we had a wonderful adventure exploring the nooks and crannies of their new church. Their participation along with the twenty adults who came made this a memorable morning for me. For me, a new fellowship of caring relationships is forming. When a pastor moves to a new congregation, it can be tough to bring closure to the many relationships at the old congregation. I realize that has been a challenge for me. Yet the greatest joy comes in being open to the new relationships at Resurrection. This is where God has called me and where I plan to give my emotional and spiritual energy for many years to come. Someday I may run again in the Cemstone Run for Others. But it wouldn’t be the day when Allison, Owen, Ian and I are doing our spring cleaning. This entry was posted in love, Running, service, spiritual exercise and tagged Cemstone Run for Others, Resurrection Lutheran Church, Spring Cleaning, St. Andrew's Lutheran Church on April 16, 2011 by Pastor John Keller. Enter your email address to subscribe to trustliveserve and receive notifications of new posts by email.